Named for its distinctive acorn-like shape, the acorn squash belongs to the winter squash family – which also includes butternut and spaghetti squashes – although it is available year-round. Typically dark green in colour with ridges that extend from the stem end to the blossom end on the outside, the inside contains a delicious orange-yellow flesh rich in beta-carotene. 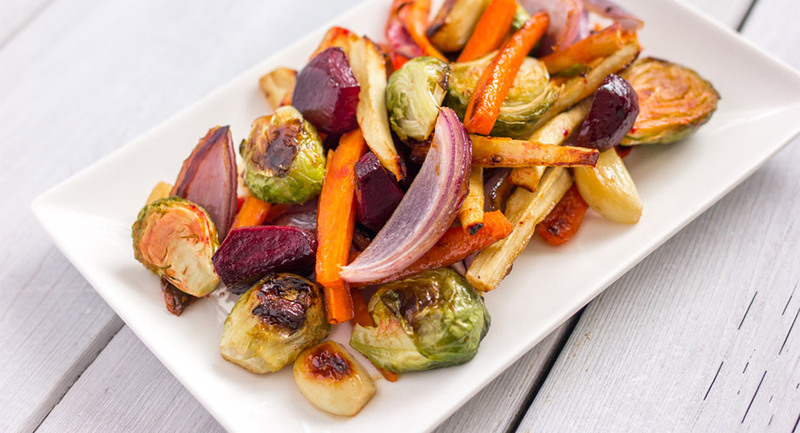 Their sweet, nutty flavour can be enjoyed in a variety of ways including baked, sautéed and stuffed. When steamed or boiled, they have a creamy texture when mashed or added to soups. 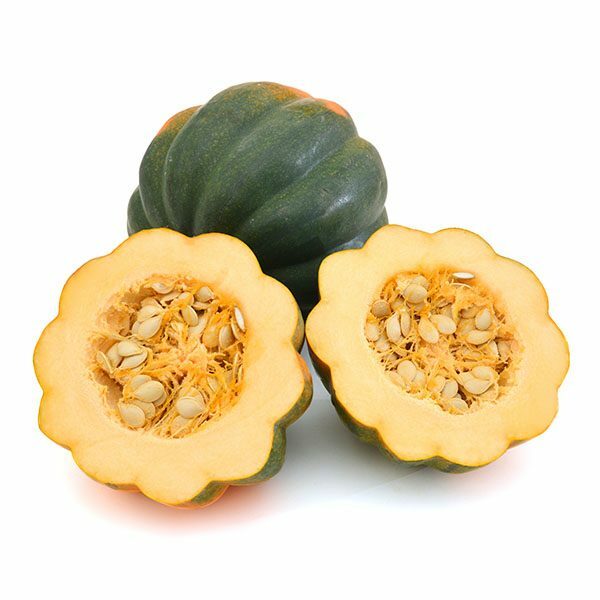 While most commonly available in a dark green colour or green with flecks of orange, acorn squashes are also available in yellow and even white varieties. The flesh is universally yellow or orange in colour and all varieties have the distinctive acorn-like shape. Choose acorn squashes with a thick shell that are heavy for their size. The stems should be attached and dry. Avoid squashes that have soft spots or cuts, which could lead to early decay. The shells should be richly coloured and matte rather than shiny. It is normal for there to be a pale orange spot where the squash rested on the ground while growing, but the spot shouldn’t be pale green, which could indicate it was picked too early. Like other hard-shelled winter squashes, acorn squashes are ideal for long-term storage. Keep them in a cool, dry place for up to two months before consuming. Dryness delays bacterial growth, so allow adequate air circulation around your squash to prevent moisture from developing on the surface. Don’t store your acorn squashes near apples or pears as the ethylene gases released by these ripening tree fruits can shorten the storage life of your squash. The shells and seeds are also edible although are usually discarded. The seeds can be rinsed, dried and toasted on low heat in the oven like pumpkin seeds for snacks, muffins, granolas and soup garnishes. An acorn squash is typically between one and two pounds in weight, which can make it easier to work with than larger winter squashes. Slice in half vertically with a large sharp knife and scoop out the seeds with a spoon. The shell can either be removed with a sharp knife before cooking or the flesh can easily be scooped out of the shell with a spoon after cooking. To steam: Remove the seeds and shell and chop the squash into bite-size pieces or slices. Place in a steamer basket over boiling water for 20 to 30 minutes until fork tender. To boil: Remove the seeds and shell and chop the squash into bite-size pieces or slices. Fully submerse in water, then boil for 20 to 30 minutes until fork tender. (The smaller the pieces the faster it will cook). Once soft, drain using a colander. To bake: Chop the squash into halves, remove the seeds and cut into bite-size pieces or slices and spread out on a baking sheet lined with parchment paper. If desired, brush with oil and sprinkle with salt and pepper or other seasonings. Bake in a preheated 400F oven for 30-45 minutes until fork tender. Alternatively, keep the halves intact and lay them cut side up on a baking tray. Add one tsp of butter inside each half and sprinkle with a generous tsp of brown sugar or a tbsp of maple syrup, then bake as instructed above. To microwave: Chop into halves and scoop out the seeds. Cook cut side down on a microwaveable plate on high in 5 minute intervals, for about 7-10 minutes until fork tender. Cooking times will vary depending on the size of squash and the power of your microwave. Peel the squash with a sharp knife and scoop out the seeds. Chop the squash into bite-size pieces and spread out in a single layer on a baking sheet. Place the baking sheet in the freezer until the pieces are frozen. Transfer to a freezer bag and label. Store in the freezer for up to 6-months, adding the pieces to soups or stews as needed. You can also steam, bake or microwave the squash first and purée or mash the flesh before freezing. Store in air-tight containers or freeze in an ice cube tray and transfer to freezer bags to use in smaller portions. If you freeze plain, cooked and pureed squash in ice cube trays, it becomes a favourite baby food! Try serving it blended with other purees such as apple, pear, carrot, or sweet potato. If you are planning to serve acorn squash in halves, slice a small round off the bottom of each half before cooking to help them sit flat on a plate when served. Keeping chunks of acorn squash in the freezer makes it easy to add quickly and easily to stir-fries, rice and pasta dishes. Acorn squashes make beautiful fall and winter table decorations during storage. Display on a long narrow platter with other winter squashes for simple edible, seasonal décor. As a bonus, keeping them visible will remind you to enjoy them more frequently. What Goes Well With Acorn Squash? Whatever you can serve in a bread bowl you can serve in an acorn squash “bowl” including seafood chowders, stews and soups such as this Acorn Squash Soup with Warm Spices from Chatelaine served right in the squash. 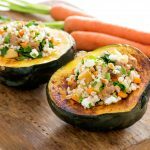 Try stuffing acorn squash halves with a mixture of ground sausage meat, onions and hardy herbs such as sage and thyme before baking in the oven for a simple main course, such as this Sausage and Barley Stuffed Acorn Squash. Drizzle acorn squash halves with a little maple syrup and bake for an easy dinner side with crispy, caramelized edges. This Balsamic-Maple Acorn Squash recipe from Kraft Canada makes a quick and delicious side dish. Try mashing steamed or boiled squash with butter and seasonings. You can simply flavour with salt and pepper, or try a little sprinkle of brown sugar and nutmeg or even a little drizzle of real maple syrup! This Apple-Maple Acorn Squash Purée from Daily Loaf even uses naturally sweet apple cider. Why buy store bought soup when this Roasted Apple and Squash Soup recipe from Ontario Apples is so flavourful and quick! According to the Canadian Nutrient File, 100 g of baked acorn squash contains a great number of your daily-recommended intake of nutrients: 18% of Vitamin C, 17% of magnesium, 12% of potassium, 11% of Vitamin B-6, 9% of folate, 8% of fibre (1.9 g), 7% of iron, 6% of Vitamin A, 5% of niacin, and 4% of calcium.